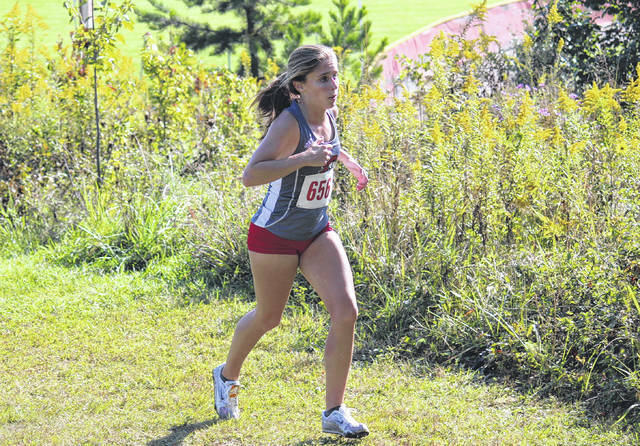 Point Pleasant junior Allison Henderson competes in the girls high school race as part of the Patty Forgey Invitational cross country meet on Sept. 23 in Rio Grande, Ohio. MINERAL WELLS, W.Va. — Luke Wilson will be returning to the West Virginia state cross country meet. That’s because Wilson, the junior standout from Point Pleasant, captured a fourth-place finish in Thursday’s Class AA-A Region 4 championship — held at the Wood County 4-H Grounds. While the Black Knights did not have the minimum five runners in order to record a team score, Wilson was among the top 16 individuals who automatically punch their tickets to the state competition. Of the 80-runner field, Wilson (16:59) was fourth across the finish line in one second shy of an even 17 minutes, as he was 13th overall in last year’s regional — improving his time by a full minute and 10 seconds. He trailed only Aaron Withrow of Winfield (16:20), Bryce Jarrell of Ravenswood (16:39) and Luke Lumadue of Winfield (16:43) for the overall individual title. Wilson, in reaching the state meet last year, became the first Point Pleasant runner to do such since Andrea Porter in 2012. The last Black Knight before Wilson to run at the state tournament was John Kinniard eight years ago. Point Pleasant fielded four runners at the regional, including repeat performers from last year’s regional in sophomores Isaac Daniels and Ethan Scott. Daniels finished 36th in 21 minutes and five seconds, while Scott was just four places and 16 seconds behind him in 40th and 21:21. Daniels and Scott improved upon their respective 54th (23:20) and 47th (22:25) finishes from last year. The only other Black Knight runner was senior Alex Foster, who was 80th in 31:26. For the Lady Knights, they only had one runner compete at the regional — as junior Allison Henderson nearly joined Wilson at the state meet. Henderson, in finishing 14th in 22 minutes and 18 seconds, was just outside of the top 10 individuals from Region 4 who automatically qualify. The 10th-place time completed the 5K distance in 21 minutes and seven seconds. Henderson was one of 48 individuals in the girls race, as she was 12th in last season’s meet in 22:46. Winfield swept the team championships, posting a score of 32 on the boys side and a 33 on the girls. The other three boys clubs to qualify from Region 4 were Ravenswood (79), Williamstown (84) and Parkersburg Catholic (94), while Williamstown — with a total of 43 —was the only other girls squad from the region to advance. Rounding out the boys team scores were Buffalo (121), Wirt County (149), Nitro (153), Scott (207), Huntington St. Joseph (228) and Calhoun County (263). The only other girls full teams were Wayne (89), Sissonville (91) and Huntington St. Joseph (95). The Class AA-A state championship meet will take place on Saturday at Cabell Midland High School. Complete results of the 2017 Class AA-A Region 4 meet are available online at www.runwv.com.